San Diego, CA – Magic 92.5 will present the radio station’s first ever “Magic 92.5 Lifetime Achievement Award” to Art Laboe, the radio veteran and host of the annual “Art Laboe Valentines Super Love Jam” concert, happening this Saturday night at Pechanga Arena. The entire Magic 92.5 on-air staff, including hosts of nationally syndicated shows including Greg Mack, will present the Magic 92.5 Lifetime Achievement Award to Laboe on stage at the “Love Jam” concert, in front of the 6,000+ concert attendees. 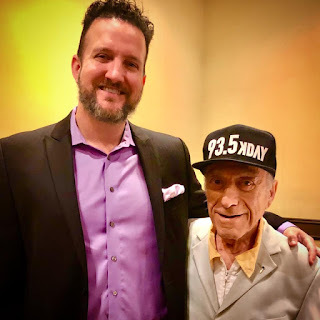 Laboe’s other awards include a star on the Hollywood Walk of Fame, induction into the National Radio Hall of Fame in 2012, and ‘Art Laboe Day,’ declared by the City of Los Angeles twice, in 1981 and again in 2015. The Art Laboe Sunday Special airs Sunday nights at 8:00pm on Magic 92.5. Magic 92.5 (XHRM-FM) is owned by Local Media San Diego, LLC, a San Diego-based media company. LMSD also owns and operates Z90.3 (XHTZ-FM), 91X (XTRA-FM), Local Media Digital Labs, a locally-focused digital solutions provider, Local Media San Diego Events for lifestyle event production, and offers in-house video and audio production.